“At a time when the global economy is doubting itself in the face of Brexit, the U.S. consumer is emerging with a smile on his face,” said Gregory Daco, head of U.S. macroeconomics at Oxford Economics. I find it hard to see much reason for smiles! That´s not what the data show. 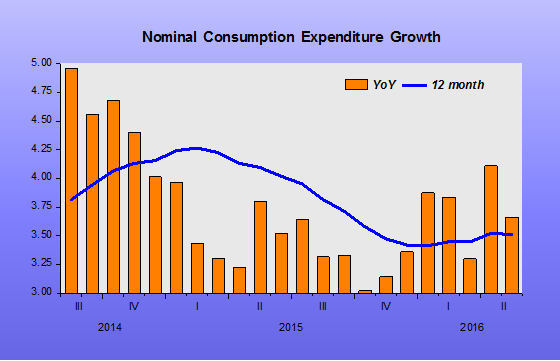 The chart indicates that nominal consumption expenditure growth has come down over the past two years. The basic reason is the Fed tightening of monetary policy through the “rate hike talks”. On a smoother basis (12-month growth), it has fallen and has remained reasonably flat. 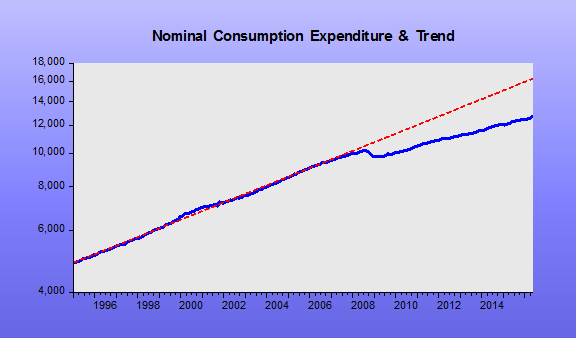 The chart below clearly illustrates that consumption is depressed! Both the spending level and the trend growth are below what they were. Maybe Gregory Daco is mistaking “open mouth” for “smile”! 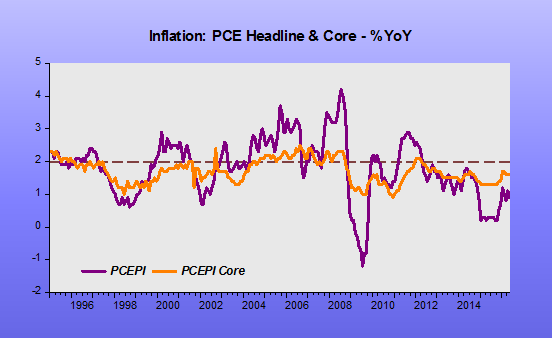 What about the Fed´s inflation mandate? The Fed does not understand what inflation means! Sometimes they think it´s the “oil price”, sometimes the “foreign exchange” and sometimes, “other stuff”. The fact is that for the past 20 years “inflation” has not been a problem. And given the (low) growth rate of spending, inflation will blossom only through a miracle! 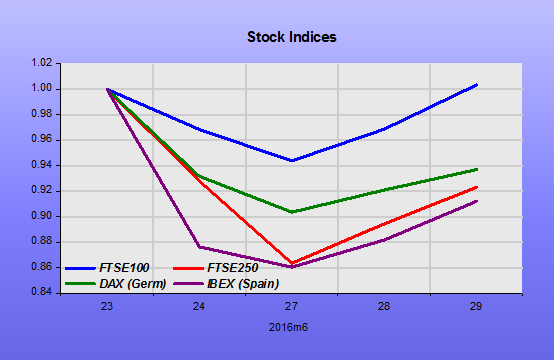 Stock Indices turnaround. Note how the “German Kid” is slow! You might think the transcontinental University of Chicago grad Rajan has in mind tighter money everywhere and always, because a looser monetary stance would lower the exchange rate of a nation’s currency, and that is a “beggar thy neighbor” policy. Until recently, helicopter drops have been heresy in monetary circles, despite the success of money-financed fiscal programs in averting the brunt of the Great Depression in Japan, under their brilliant central banker, Takahashi Korekiyo. But of late the likes of British monetary authority Lord Adair Turner and noted Colombia University scholar Michael Woodford have tipped their hats to helicopter drops. Fun would be to listen in on a podcast between senior research fellow with the Mercatus Center Program on Monetary Policy economist David Beckworth and Rajan. But why blame Brexit? The Fed has been tight for years, as seen by the shriveled inflation, NGDP growth and interest rates of the United States. Perhaps Beckworth should ask if Rajan thinks the U.S. Fed should loosen up and let some air into the global economy, given the “international obligations” of Chair Janet Yellen. And helicopter drops? Hey, send in the B-52s. Why dilly-dally around? You can tell that monetary policy has been hyper-accommodative from the soaring interest rates and inflation seen globally, right? So let’s see: U.S, 10-year Treasuries are offering a 1.48% yield. In shades of the Weimar Republic, the German 10-year Bund is up to a 0.05% yield. No, that is not 0.50%. It is 0.05%. And Japan, or Switzerland? Don’t even ask. These proclamations are being issued from the BIS as it has just released it annual report, parts of which have been written in deep, even abject confusion. For example, the report conducts a round-robin of global central banks, including even those of S. Korea, Japan, China, Indonesia and Thailand, and finds all are below inflation targets. This is blamed on falling commodity prices, which have undercut the “very accommodative” monetary policies of central bank after central bank. The BIS contends that easy money extended for years on end has led to falling commodity prices and even deflation, as seen in Sweden, Switzerland and Japan. The solution to dead prices and anemic growth is structural and financial reforms, avers the BIS. In combination with, of course, tighter money. I am glad we have the Basel, Switzerland-based BIS’ers to tell us the politico-economic facts of life. Who ever dreamed that democracies, and probably even worse, the statists in mainland China, needed economic structural reforms? Of course, Singapore is also struggling with deflation (headline CPI down 1.8% YOY in May) and the city-state recorded no real economic growth in 2015, and only 0.2% Q-o-Q real economic growth in Q1 2016, at SAAR. Evidently, Singapore (cited by many as a kind of structural econo-nirvana) is in need of extensive structural reforms, even worse than the United States. It is confounding that the globe’s central bankers cannot fathom they will never get back to “normal” interest rates if they continue to asphyxiate the global economy with tight money. Moreover, no nation will ever have the kind of regulations and tax laws that macroeconomists would prefer. As a consequence, monetary policy has to be made in the real word, as it is. And anyway, is the problem of slow real global growth structural and not monetary? Brexit aside, the world’s economies are more open to trade and innovation than ever before, connected by Internet no less. Services can be dispensed globally by the click of a button, and there are more large cargo ships than ever. Why has econo-nirvana Singapore slipped into deflation and anemic growth? Structural problems? Sadly, the retrograde, even punitive tight central-bank monetary policies are promoting the very kinds of socialism and nationalism that will undercut real economic growth. Well, unless some nationalists seize control of a central bank. Even that might be an improvement. Yet more sad news: Blogger Dajeeps has pointed out that Don Trump appears to have a better feel for monetary policy than Hillary Clinton. Trump talks about monetizing debt while Hillary says it was easy money that collapsed the US economy. Hillary appears headed for the White House, where no doubt she will embrace the effectively tight money policies of Janet Yellen. Post-Brexit, what will Janet Yellen’s next excuse be? Well the British have voted for Brexit. We shall see how it turns out. Market Monetarists must hope that Mark Carney doesn’t seek to defend the pound, but let currency weakness do it’s magic, monetarily offsetting any expected economic weakness. A drop in the pound is not like a drop in the price of a company after a profit warning that reflects a weaker future. Of course, a hit to potential economic growth will damage the value of the UK economy but the currency is a different issue. Currency reflects the monetary value of the economy not its real economic prospects. Low or negative real economic growth but with even lower inflation tends to see currency appreciation, like in Japan or Switzerland. If there were expected to be 5% real growth and 5% inflation, other things being equal, the currency would not move. If (as 95% of economists forecast) the UK leaving the EU were to result in 5% less real economic growth over time, or even a recession, then the central bank should ensure nominal growth stays at a level 5%. The pound could then fall up to 10%, other things being equal, ie ignoring what other currency blocs are doing. That would be the right thing for the central bank to allow and even facilitate. The currency drop would then automatically boost domestic demand offsetting the drop from “lost confidence” in the future, or whatever is supposed to happen to the UK outside the EU. I suspect no such dramatic drop in real GDP as things change very slowly when it comes to international affairs, and businesses and consumers adjust their behaviour to fit the expected new environment. The UK government should focus on eliminating any supply side restraints on the economy and any potential tariffs that the EU may impose. Clearly the remaining EU members should be very careful about entering tariff wars given the modest nominal and real growth they currently enjoy. 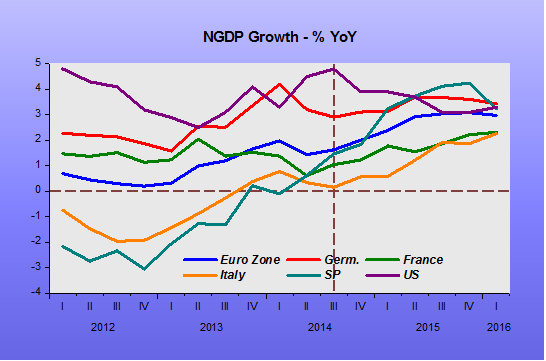 The Euro Area likewise. The Euro Area should move to a loose monetary policy by either abolishing the inflation ceiling or better still targeting nominal growth of 4-5%. Draghi was recently asked in the European Parliament why he didn’t raise the inflation target. His reply betrayed a profound confusion about his current stance. His ECB projects 1.6% inflation two years away. De jure, his monetary stance is only neutral. De facto, market prices indicate much lower inflation two years out, thus the stance is actually very tight. Raising the inflation target or introducing nominal income growth targets would allow the market to expect no tightening if inflation were to go above 2%, thus easing policy as expectations for policy would be easier. What will Yellen do next? The more interesting question for the US is what excuse Janet Yellen might now have to come up with to explain away the consequences of the Fed’s tight monetary policy. She may think it is “highly accommodative” because rates are low and the Fed balance sheet bloated with QE securities. To be fair, very many economists and market commentators think likewise, making the same basic mistake. But Market Monetarists know better. Monetary policy is judged by market expectations for nominal growth and these remain low. Current NGDP growth is low and both straight long duration government bonds and TIPs indicate very low inflation. Yet the FOMC is indicating seven rate rises of 25bps over the next two and half years, with another three promised in the long run. Tight or what? Policy is tight because it is expected to be tight for the next two years. The result has been weakening nominal growth, weakening real growth, and low nominal wage growth. Real wage growth has supposedly been better but it certainly hasn’t felt like it – hence the rise and rise of populist politics.